Hill, A.J. Live sound subwoofer system performance quantification. 144th Convention of the Audio Engineering Society, Milan, Italy. May, 2018. Moore, J.B.; A.J. Hill. Applications of dynamic diffuse signal processing in sound reinforcement and reproduction. Proc. Institute of Acoustics – Conference on Reproduced Sound, Nottingham, UK. November, 2017. Durbridge, S.E. ; A.J. Hill. Efficient acoustic modelling of large acoustic spaces using finite difference methods. Proc. Institute of Acoustics – Conference on Reproduced Sound, Nottingham, UK. November, 2017. Moore, J.B.; A.J. Hill. Dynamic diffuse signal processing for low-frequency spatial variance minimization across wide audience areas. 143rd Convention of the Audio Engineering Society, New York, USA. October, 2017. Hill, A.J. Practical considerations for subwoofer arrays and clusters in live sound reinforcement. 3rd International Conference on Sound Reinforcement – Open Air Venues, Struer, Denmark. August, 2017. Hammond, R.; P. Mapp; A.J. Hill. Disagreement between STI and STIPA measurements due to high level, discrete reflections. 142nd Convention of the Audio Engineering Society, Berlin, Germany. May, 2017. Moore, J.B.; A.J. Hill. Optimization of temporally diffuse impulses for decorrelation of multiple discrete loudspeakers. 142nd Convention of the Audio Engineering Society, Berlin, Germany. May, 2017. Hill, A.J. ; J. Paul. The effect of performance stages on subwoofer polar and frequency responses. Proc. Institute of Acoustics - Conference on Reproduced Sound, Southampton, UK. November, 2016. Vilkaitis, A; M. Dring; C. Middlicott; B. Wiggins; A.J. Hill. Room Acoustics and Virtual Reality: An implementation of auralisation and 360 degree image techniques to create virtual representations of spaces. Proc. Institute of Acoustics - Conference on Reproduced Sound, Southampton, UK. November, 2016. Hammond, R.; P. Mapp; A.J. Hill. The Influence of Discrete Arriving Reflections on Perceived Intelligibility and Speech Transmission Index Measurements. 141st Convention of the Audio Engineering Society, Los Angeles, USA. October, 2016. Lusted-Kosolwski, C.; J.J.B. Piercy; A.J. Hill. Defining true propagation patterns of underwater noise produced by stationary vessels. Proc. 4th International Conference on the Effects of Noise on Aquatic Life, Dublin, Ireland. July, 2016. Hammond, R.; P. Mapp; A.J. Hill. The influence of discrete arriving reflections on perceived intelligibility and STI measurements. 140th Convention of the Audio Engineering Society, Paris, France. June, 2016. Durbridge, S.E. ; A.J. Hill; J. Taylor. "The effects of distortion on the perception of loudness in live sound." Proc. Institute of Acoustics - Conference on Reproduced Sound, Moreton-in-Marsh, UK. November, 2015. Hill, A.J. ; M.O.J. Hawksford, P. Newell. "Enhanced wide-area low-frequency sound reproduction in cinemas: Effective and practical alternatives to current sub-optimal calibration strategies." 57th International Conf. of the Audio Engineering Society, Hollywood, USA. March, 2015. Hill, A.J. ; M.O.J. Hawksford. "Subjective evaluation of an emerging theory of low-frequency sound source localization in closed acoustic spaces." Proc. Institute of Acoustics - Conference on Reproduced Sound, Birmingham, UK. October, 2014. Hill, A.J. ; M.O.J. Hawksford. "Low-frequency sound source localization as a function of closed acoustic spaces." Proc. IOA - Reproduced Sound 2013, Manchester, UK. November, 2013. Harrison, J.; A.J. Hill. "A scientific approach to microphone placement for cymbals in live sound." Proc. IOA - Reproduced Sound 2013, Manchester, UK. November, 2013. Hill, A.J. ; M.O.J. Hawksford. "On the perceptual advantage of stereo subwoofer systems in live sound reinforcement." 135th Convention of the Audio Engineering Society, New York. October, 2013. Hill, A.J. ; K. Lane; A.P. Rosenthal; G. Gand. "Live event performer tracking for digital console automation using industry-standard wireless microphone systems." 135th Convention of the Audio Engineering Society, New York. October, 2013. Hill, A.J. "Music to our ears: The effect of background music in higher education learning environments." 135th Convention of the Audio Engineering Society, New York. October, 2013. Hill, A.J. ; S.P. Lewis; M.O.J. Hawksford. "Towards a generalized theory of low-frequency sound source localization." Proc. IOA - Reproduced Sound 2012, Brighton, UK. November, 2012. Hill, A.J. ; M.O.J. Hawksford. "Low-frequency temporal accuracy of small-room sound reproduction." 133rd Convention of the Audio Engineering Society, San Francisco, USA. October, 2012. Hill, A.J. ; M.O.J. Hawksford. "Practical applications of chameleon subwoofer arrays." 132nd Convention of the Audio Engineering Society, Budapest, Hungary. April, 2012. Hill, A.J. ; M.O.J. Hawksford. "Individualized low-frequency response manipulation for multiple listeners using chameleon subwoofer arrays." Proc. 3rd CEEC (IEEE Xplore), Colchester, UK. July, 2011. Hill, A.J. ; M.O.J. Hawksford; A.P. Rosenthal; G. Gand. "Kick-Drum signal acquisition, isolation and reinforcement optimization in live sound." 130th Convention of the Audio Engineering Society, London, UK. May, 2011. Hill, A.J. ; M.O.J. Hawksford. "Chameleon subwoofer arrays in live sound." Proc. IOA - Reproduced Sound 2010, Cardiff, UK. November, 2010. Hill, A.J. ; M.O.J. Hawksford. "Wide-area psychoacosutic correction for problematic room modes using non-linear bass synthesis." 129th Convention of the Audio Engineering Society, San Francisco, USA. November, 2010. Hill, A.J. ; M.O.J. Hawksford. "A hybrid virtual bass system for optimized steady-state and transient performance." Proc. 2nd CEEC (IEEE Xplore), Colchester, UK. September, 2010. Hill, A.J. ; M.O.J. Hawksford. "Multi-band low-frequency room correction with chameleon subwoofer arrays." EAA - EUROREGIO 2010, Ljubljana, Slovenia. September, 2010. Hill, A.J. ; M.O.J. Hawksford. "Chameleon subwoofer arrays - Generalized theory of vectored sources in a closed acoustic space." 128th Convention of the Audio Engineering Society, London, UK. May, 2010. Hill, A.J. ; M.O.J. Hawksford, A.P. Rosenthal; G. Gand. "Subwoofer positioning, orientation and calibration for large-scale sound reinforcement." 128th Convention of the Audio Engineering Society, London, UK. May, 2010. Hill, A.J. ; M.O.J. Hawksford. "Seeing through the darkness: Visualizing low frequency behavior in small rooms." Proc. IOA - Reproduced Sound 25, Brighton, UK. November, 2009. Hill, A.J. ; M.O.J. Hawksford. "Visualization and analysis tools for low frequency propagation in a generalized 3D acoustic space." 127th Convention of the Audio Engineering Society, New York, USA. October, 2009. Green, K.; A. Hill; Y. Morton; M. Miller; J. Campbell; "A real-time position, velocity, and physiological monitoring and tracking device for equestrian training." Proc. ION GNSS 2007, Ft. Worth, USA. Sept, 2007. Live sound engineer for Gand Concert Sound (Elk Grove Village, IL, USA) since 2003. Hill, A.J. ; Hawksford, M.O.J. ; Newell, P. Enhanced Wide-Area Low-Frequency Sound Reproduction in Cinemas: Effective and Practical Alternatives to Current Calibration Strategies. Journal of the Audio Engineering Society, vol. 64, no. 5, pp. 280-298. May, 2016. Piercy, J.J.B. ; D.J. Smith; E.A. Codling; A.J. Hill; S.D. Simpson. "The good, the bad, and the distant: Soundscape cues for larval fish." Advances in Experimental Medicine and Biology, vol. 875, pp. 829-837. November, 2015. Piercy, J.J.B. ; E.A. Codling; A.J. Hill; D.J. Smith; S.D. Simpson. "Habitat quality affects sound production and likely distance of detection of coral reefs." Marine Ecology Progress Series, vol. 516: 35-47, 2014. Hill, A.J. ; M.O.J. Hawksford. "Wide-area psychoacoustic correction for problematic room-modes using nonlinear bass synthesis." Journal of the Audio Engineering Society, vol. 59, no. 11, pp. 825-834. November, 2011. Hill, A.J. ; M.O.J. Hawksford. "Visualization and analysis tools for low-frequency propagation in a generalized 3D acoustic space." Journal of the Audio Engineering Society, vol. 59, no. 5, pp. 321-337. May, 2011. Hill, A.J. ; M.O.J Hawksford. "Chameleon subwoofer arrays in live sound." Institute of Acoustics, Acoustics Bulletin, vol. 36, no. 3, pp. 32-40. May/June, 2011. Adam Hill, Senior Lecturer in Audio Engineering, explains how his research can predict the health of coral reefs using underwater virtual bass algorithms. 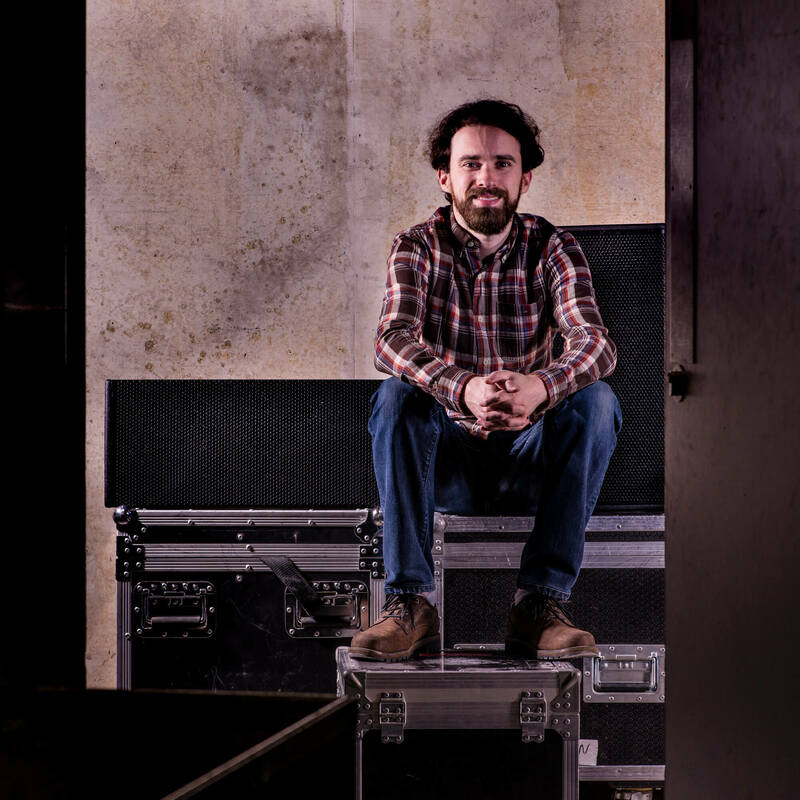 Adam Hill, lecturer at the University of Derby, shares his passion with his students, and talks about his expertise and experience working on live events.